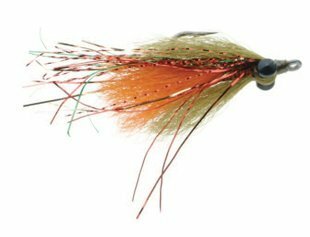 Sub-Surface bass flies for the most part imitate the forage creatures that bass prey on, specifically; baitfish (minnows), sculpins, leeches or crayfish. In each case we see very life-like imitations being designed in a wide range of colors, shapes and sizes. Pictured here is an excellent fleeing baitfish imitation called Clouser Darter by the sub-surface bass fly master Bob Clouser. Weighted eyes are a big part of this category of flies. Lead bar bell eyes come in a number of different ways such as plain unfinished, painted and nickel plated. Painted lead bar bell eyes seem to be the most prevalent style however there are other more environmentally friendly options like tungsten and brass hour glass eyes. Most eyes are sized by weight and/or the size of eye itself with 1/100 oz (1/8”) being the smallest and 1/10 oz (9/32”) being the largest. Recipes call for a good deal of synthetic materials like Polar Fibre, Flash N Slinky, Super hair and FisHair however natural materials, especially rabbit fur stripes are still found in many patterns. Hook sizes and styles vary greatly depending on the prey being imitated and you will find saltwater hooks used often even though these are freshwater patterns. Sunfish (Deerhair Variation) Pattern Recipe: Hook-TMC8089NP, Thread- Olive 3/0, Weedguard- 20 lb Mason Hard Nylon, Rib- Medium copper wire, Body Olive Antron dubbing, Wing Olive grizzle hackle tied upright, Gills- Red marabou, Collar Spun and trimmed to shape Deerhair olive upper and orange lower, Overwing- Olive marabou tied sparse over back, Head- Olive and orange Deerhair spun and trimmed to shape, Eyes- Molded 3-D.